Once again, New Yorkers flocked to Governors Island for the Annual Vendy Awards to determine the Best Street Food Vendor and to raise funds for the Street Vendor Project, a non-profit providing "advocacy and support for the thousands of people who sell food and merchandise on the street." Once again, New Yorkers flocked to Governors Island on September 12, for the Annual Vendy Awards to determine the Best Street Food Vendor of the year and to raise funds for the Street Vendor Project, a 14-year-old non-profit providing "advocacy and support for the thousands of people who sell food and merchandise on the street." 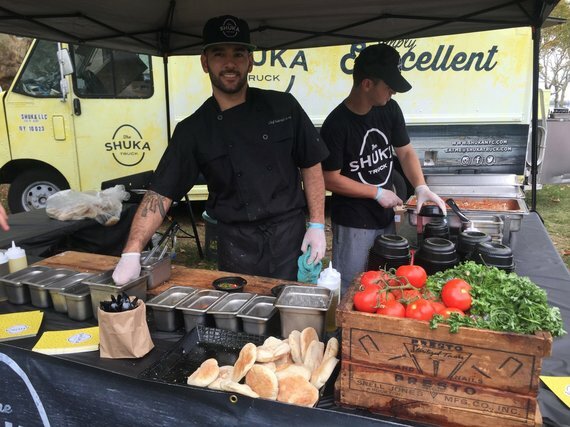 From ancient pushcarts to 21st century food trucks, street vending has a long and rich tradition of providing jobs and upward mobility for generations of immigrants and aspiring entrepreneurs. Typically a family affair, today's vendors include veterans (who received special privileges), an increasingly wider range of immigrants and a younger generation who opt out of conventional work life in pursuit of food dreams. Not simply a means to an end, food vending has become an end unto itself. And you don't need to think about the social mission of the day to enjoy the amazing selection of food, drinks and sweets from the 25 vendors - you just need to come hungry, have a plan of attack, navigate lines (a strategic partner helps) and ditch the diet. I admit to never waiting on food lines, so I go for the premium VIP tickets which allows early access. It is so worth it. And I give myself permission (this day only) to sample a meat sauce for the sake of judging justly. The front line of the Vendys is the crew of volunteers - over 100 - who check in, direct, facilitate etc. 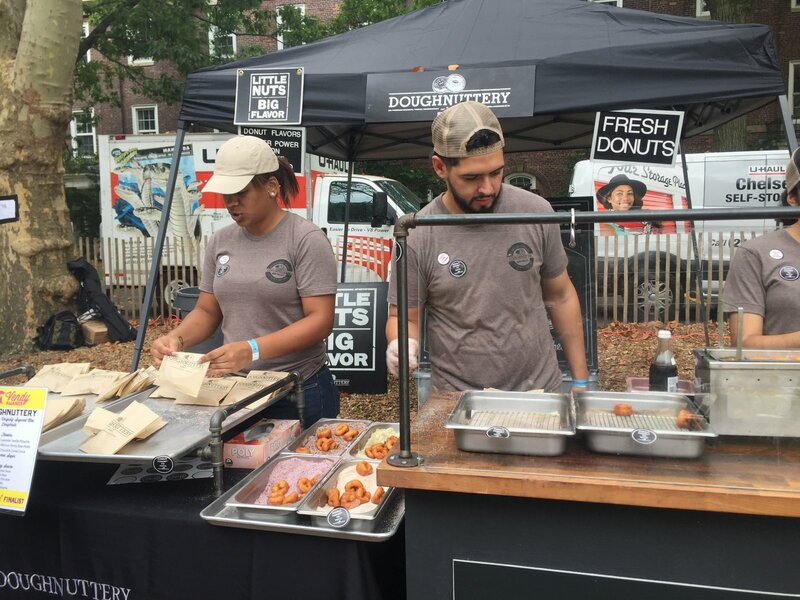 Whatever their day job, they are smart because with the gig comes the opportunity to sample all the offerings either before or after your shift. I talked with seasoned volunteers Ryan and Robert, Pace University students, who do breakdown on a very full stomach. (BTW, they have zero food business aspirations, just love to eat while studying finance.) And I was delighted to bump into a handful of my own GP colleagues directing traffic; smart kids! If the day was purely epicurean, it would be easy. But there are so many stories to hear and questions to ask. What makes a trio of post-army service Israelis start a (Shakshuka) Shuka Truck in a city that has never heard the word? The answer: Chutzpah, I guess. They got my vote. Flavor and healthful in the same bite; maybe the only dish there that was actually good for you. What sort of vision motivates someone to give up the day job to start (another) dessert company (witness Butter & Scotch with their signature maple bacon cupcake) - or build a business on a foundation of marshmallows? Only in NYC is there a market for multi-textured & flavored, dynamic marshmallows as Katherine Sprung of Squish Marshmallows explains - think Smore's or Rocky Road or even Peanut Butter and Jelly filled. (She is a tech start-up survivor, so I guess this is easy.) And its not like we need more doughnuts, but dessert category Doughnuttery 'took the cake' with their freshly fried mini gems. (What is it about fried food?!) My favorite was BOOQOO Beignets. In all fairness, I fell in love with Matt Pace, a NOLA native, at Vendy Plaza earlier this summer. He is as sweet as his pastry and doesn't break a sweat despite standing over a hot fryer for hours. Wicked good with killer dips of chicory coffee praline or creole vanilla, you can find him on Sundays at La Marqueta. PlayJScream served a J shaped cone filled on both sides. Without a flat bottom, where's the drip and the fun? "I borrowed the idea," said CK of this unpatented Korean invention. Just because I tasted each dessert does not make me a sweets person. If there were veggies, you'd be hearing about it. The closest thing was the hand cut spud from Home Frite which I would gladly eat daily savoring each cheesy, French fried, salted and dip drenched bite. Crazy good if only to try each amazing dip (think malt vinegar aioli, herbocado, jalapeno cilantro, curry ketchup - get my drift?) The Gumbo, empanadas, mole, albondiga and palatas were creative, tempting and worth the occasional nibble from this vegetarian. Thank you Gumbo Bros for the non-meat option. I was really longing for the Cinnamon Snail, a ground breaking, award winning, brilliant 100% vegan truck that fell victim this past year to the lack of availability of food truck licenses. On the subject of licenses, I asked the newer vendors how they managed to get one. The answers were a blend of 'you know', 'not easy', a dip of the head, and the unspoken truth - that you finagled, found your way to the black market and struggle to make it work. It is a tribute to this round up of vendors that despite the near impossibility of simple, legal options, they persevered and made their way to the street. It is also the proliferation of markets inspired by Smorgasbord, which provide welcome and legal outlets for new vendors. The City Council and Speaker are working to change this landscape. #liftthecaps - register your voice. Back to food. Husbands & wives, moms & sons and other cheering relatives round out the truck teams and provided the support needed to feed the long lines. The Old Traditional Polish Cuisine truck served up tempting Kielbasa and pierogis - the wife of one of the owners does their marketing off hours from her job at Calvin Klein. Her husband and partner left construction in search of something different. Every ingredient (people included) come from Poland and yes, they found their new calling. Lil Zeus enlisted Mom to man the front line. I don't know what 'nachas' is in Greek, but she had it as she hawked wraps and salads as they were ready, belting out: "Who wants a sandwich?" My other weakness is a good beverage. Renegade Lemonade, the category champ, was delicious and has morphed into a real business wholesaling to David Burke and BR Guest while planning large scale mass distribution. 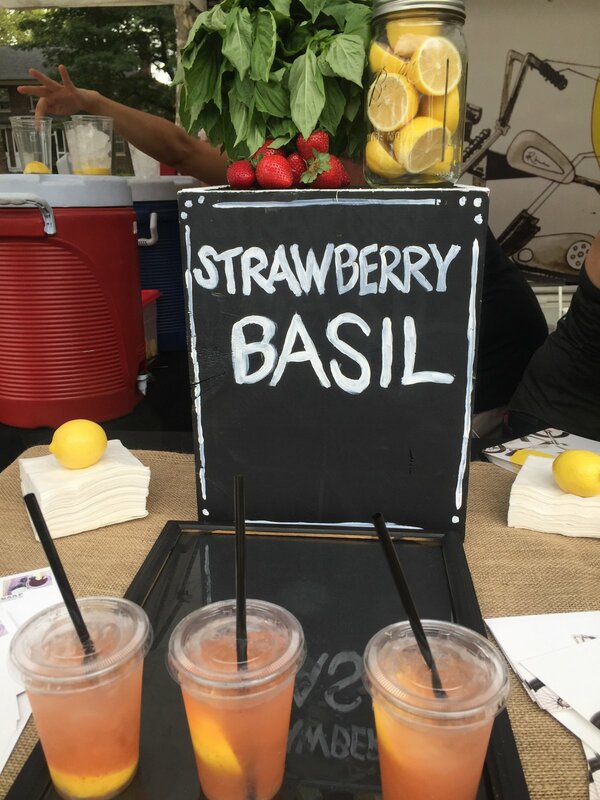 A good lemonade is an elixir and who could choose between Thai Chili Tart Cherry, Strawberry Basil or Passion Hibiscus. So I had each one. Coco&Co had a sweet tale that started when a wedding trip to Sri Lanka morphed into living on coconuts when the money ran out, which in turn spawned a coconut water based bicycle-cart. Though in business only since April, Luke (a former News Corp journalist) and partner have 10 employees. Catalina's Champurrado and Best Juice Uptown represent the heart of Street Vendors Project, immigrant families who bring tastes of their countries to their new communities. Best Juice reminds me of an Orange Julius - the Dominican drink includes fresh OJ, milk, cane sugar plus a secret ingredient. I sampled Catalina's Oaxacan Champurrado, a warm drink incorporating chocolate and corn (masa de maiz) savoring the unique blend of flavors. These are flavors of home and their audience loves them. The best for last. 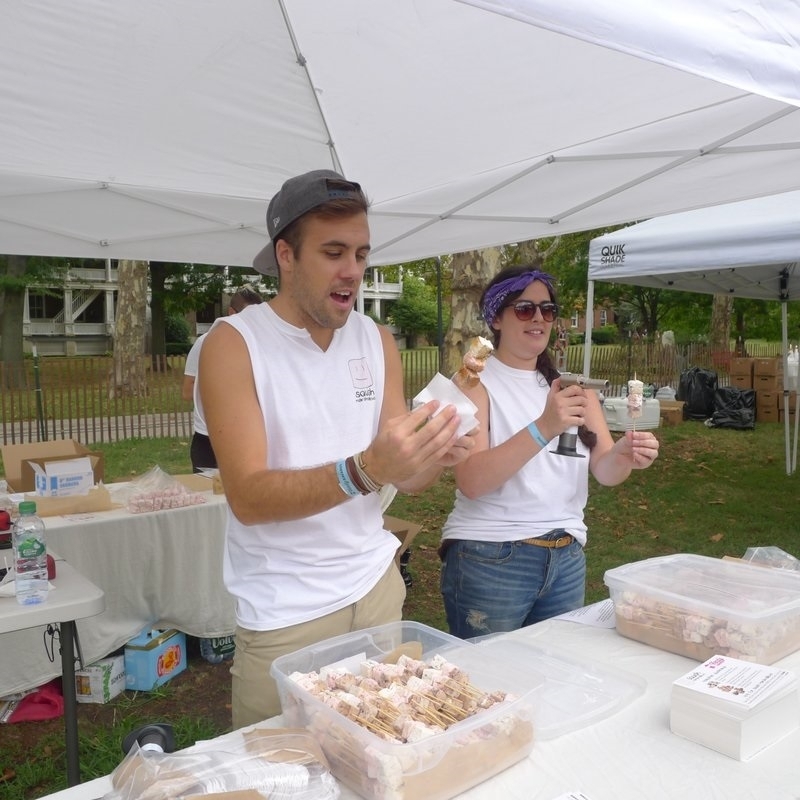 The Snowday Food Truck won 2014 Rookie of the Year and took the 2015 prize for Vendy Cup and People's Choice. Jordyn Lexton founded Drive Change to train, employ and change the lives of formerly incarcerated young people utilizing food trucks as the nucleus of her program. Work changes lives, food creates jobs and passion inspires food and work. The youth that work on the truck are real, warm and inspiring. The food is amazing - probably the finest maple grilled cheese you will ever taste. But what is truly breathtaking is thinking about the Vendys and the street vendor universe as a pathway for change. 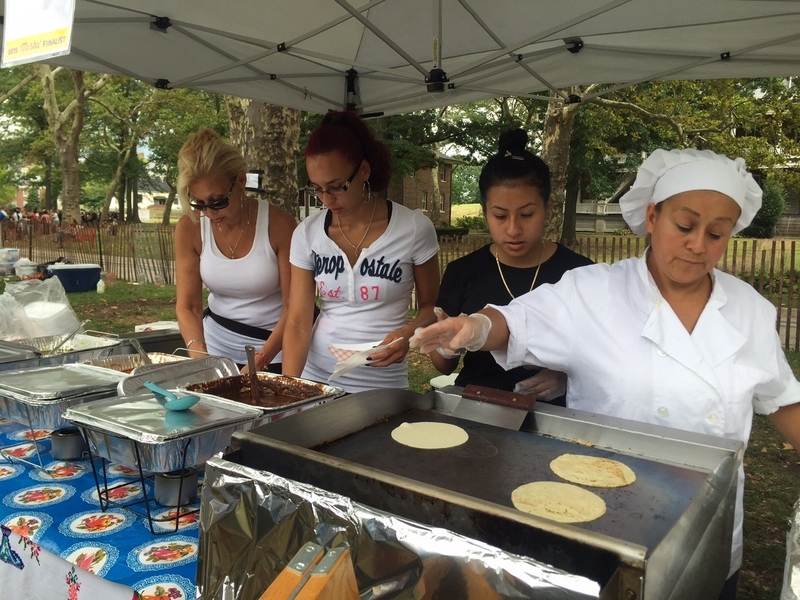 From the struggling immigrants of 150 years or 150 days ago, street vendors work hard. 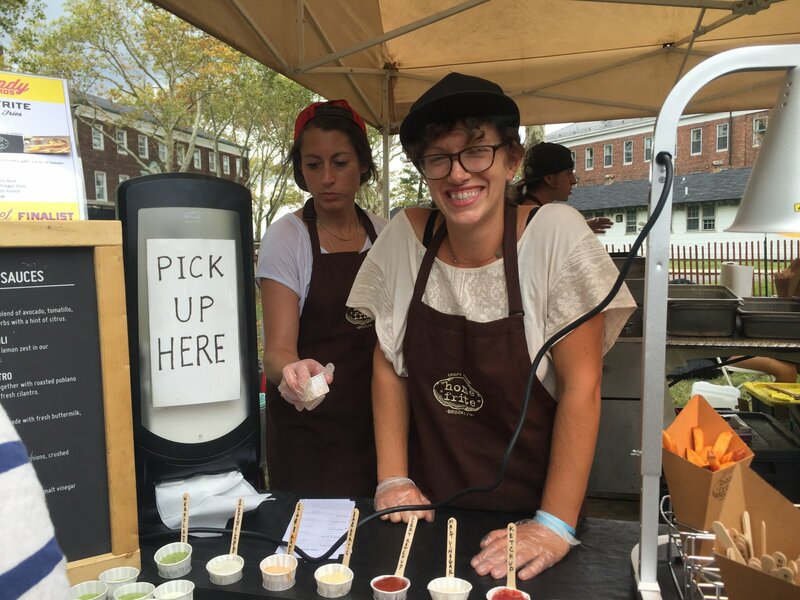 I asked Crystal of Home Frites what her advice to the novice vendor would be. She said its all about hard work and taking the plunge. It's a long day, in a hot truck, on your feet, few breaks, getting hassled by cops or storekeepers, keeping up with the customers. The very least I could do was to wait on line. So, uncharacteristically, I did. I thank the Vendy vendors for their delicious food and for sharing their stories with their words and in their flavors.